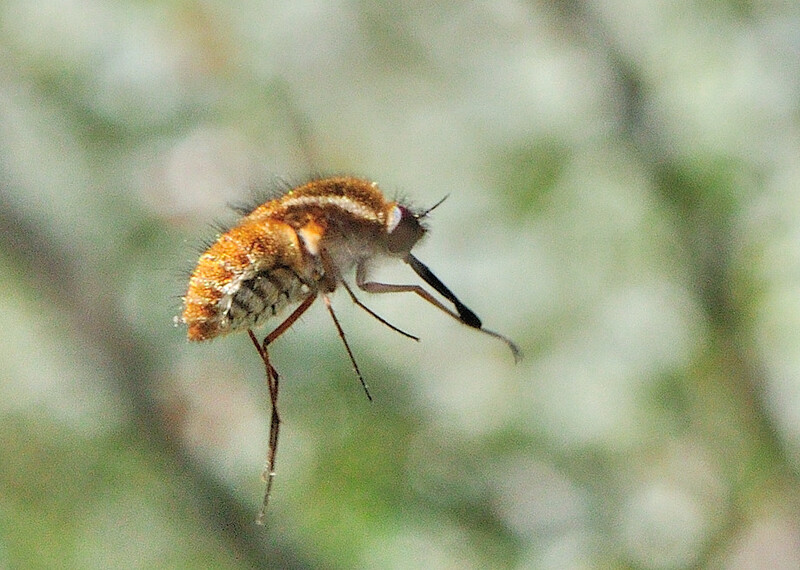 This page contains pictures and information about True Bee Flies in Subfamily Bombyliinae that we found in the Brisbane area, Queensland, Australia. 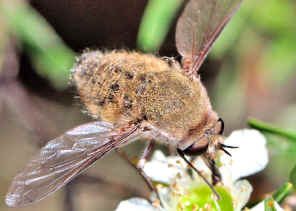 Bee Flies in the subfamily Bombyliinae usually have the stout and hairy body. They are from medium to large in size. They have long and thin proboscis. The wing vein M1 meets R5 before the wing margin. The head joint closely to thorax, i.e., no neck can be seen. The abdomen is board and oval. 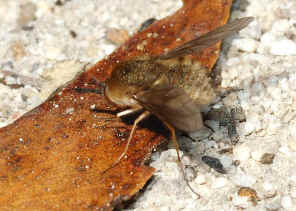 Flies in this subfamily is called True Bee Flies because their hairy body and flight habits resembles bees. 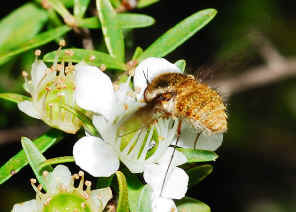 True Bee Flies have long proboscis and feed on nectar and pollen. 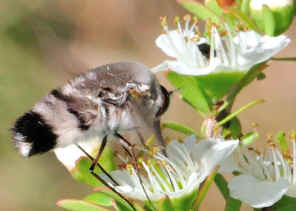 On a sunny day, they are often seen feeding on flowers, hovering over vegetation or resting on bare ground. They are the the import pollinators, some are even the primary pollinators of some species of flower plants. They are either golden brown or black and white in colours. They can be distinguished by the wing veins pattern, although still not enough information to identify them even to genus level. 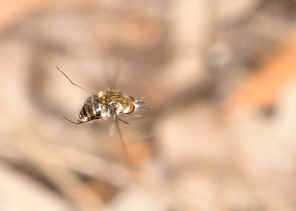 Their larvae are parasitic on other insects' eggs or larvae. This Bee Fly is large. 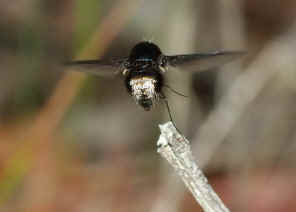 It has the stout and hairy body, with long and slender proboscis. 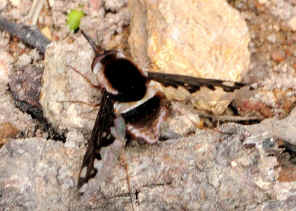 The thorax is black and abdomen segment 2-4 covered with white hairs, other segments are black. 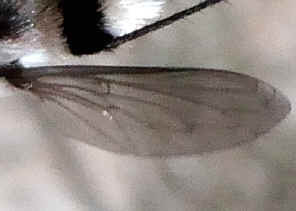 Wings are half marked with black near wing base. Please check this page for more information. This Bee Fly is large. 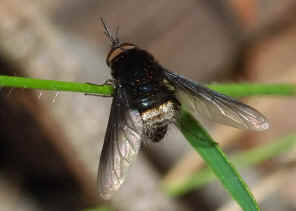 It has the stout and hairy body, with long and slender proboscis. 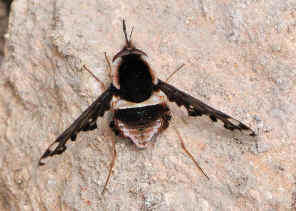 The thorax is black and abdomen segments are banded, covered with white hairs. 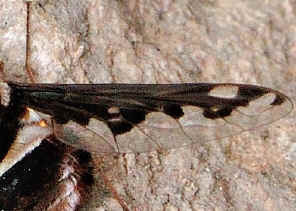 Wings are marked with black patterns. Photos were take on July 2012 in Anstead Forest. Please check this page for more information. 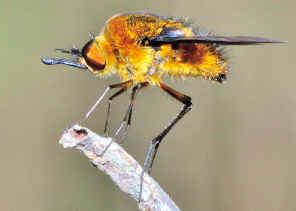 This Bee Fly has the stout and hairy body in golden brown colour, with long and slender proboscis. 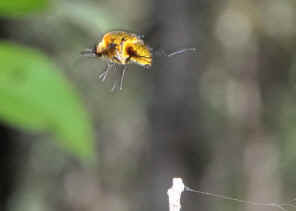 It looked similar to the Golden True Beefly above except it has two white stripes along its thorax. Check this page for more information. 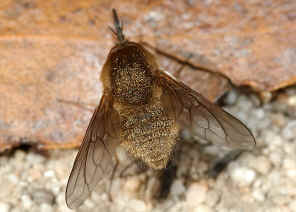 The beefly has the stout and hairy body in golden brown colour, with long and slender proboscis. All legs are in pale brown colour. Please check this page for more information. 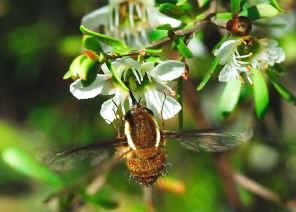 This beefly is large in size. 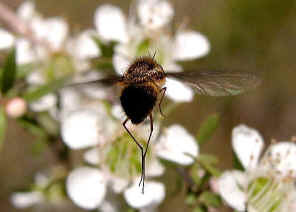 It has the stout and hairy body, with long and slender proboscis. 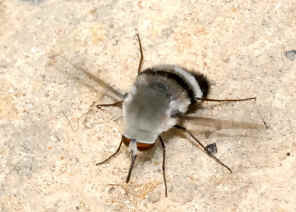 The thorax is grey and abdomen segments covered with black and white hairs. Wings are slightly tinted. Please check this page for more information. 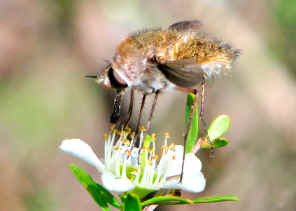 The beefly has the stout and hairy body in reddish-brown colour, with long and slender proboscis. 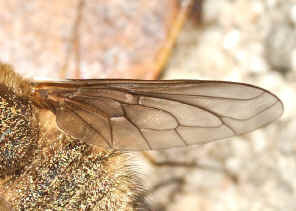 The wing vein patterns are distinctive. 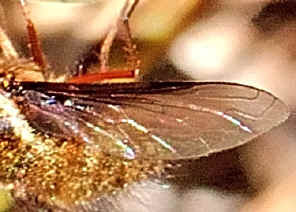 All legs are in dark brown colour. Please check this page for more information. 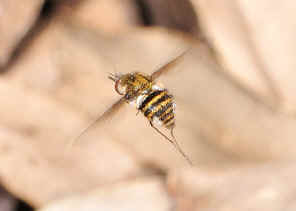 Found this small Banded True Bee Flies on Sept 2011 in Anstead Forest. 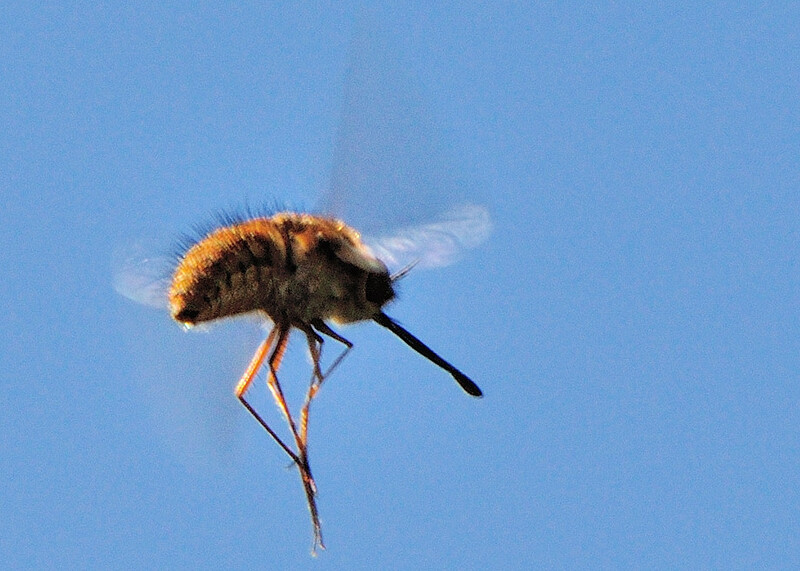 It was hovering about 10 cm over ground. It stayed on air nearly stand still and not too care about our approaching. Please check this page for more information. 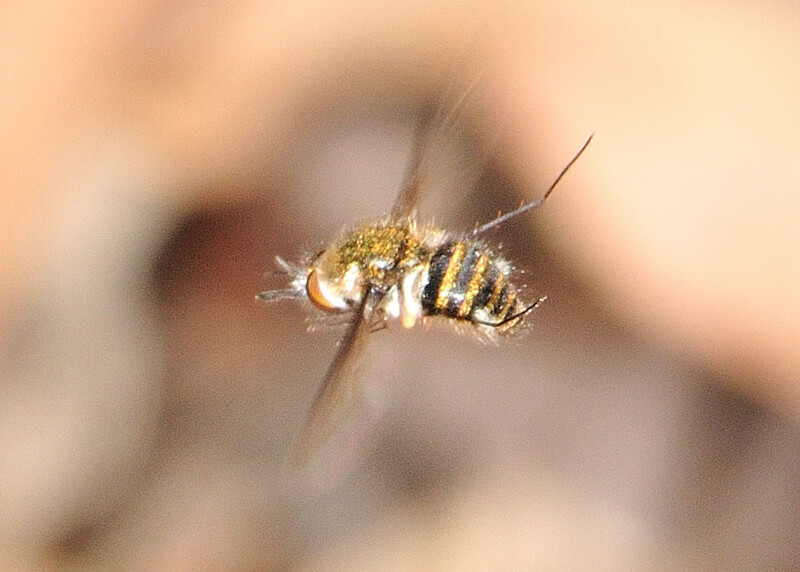 This Bee Fly is medium in size. It has the stout and hairy body. 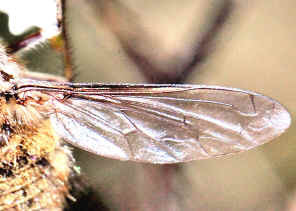 The proboscis is long and slender The thorax and abdomen are golden yellowish-brown in colours with short black hairs. 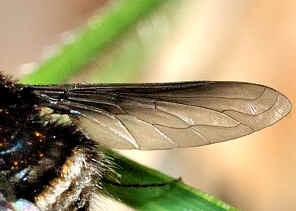 Wings are tinted in dark colour. Please check this page for more information. Pictures were taken on Alexandra Hill during late spring. We also found them resting on sandy soil in Karawatha Forest during mid summer. We have more pictures and information in this page. 1. Insects of Australia, CSIRO, Division of Entomology, Melbourne University Press, 2nd Edition 1991, p 759. 3. 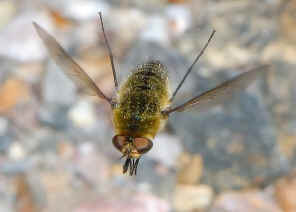 Bee Flies (Bombyliidae) - by Giff Beaton, 2005. 4. The cladistics and classification of the Bombyliidae (Diptera: Asiloidea) - by David K.Yeates, 1994. 5. 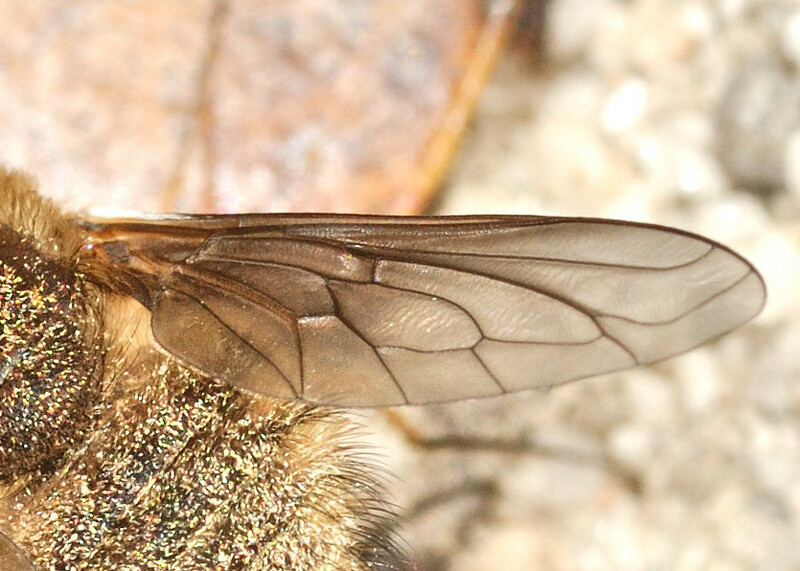 Studies in Pacific Bombyliidae (Diptera). IX. Systematic remarks on Australian Bombyliinae, with descriptions of new genera - Evenhuis, N.L. 1983, International Journal of Entomology 25: 206-214 [Date published 27 October] . Last updated: November 07, 2012.